As a mother of four Teresa Guidice still looks fabulous without the need to follow restrictive diets or an intense exercise regime. 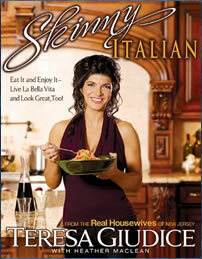 The star of the popular reality television series, “The Real Housewives of New Jersey”, says that the secret to maintaining her slim figure is a real Italian diet. In her book, Skinny Italian, she describes the important role that food plays in her life and shares a bountiful collection of authentic Italian recipes. Teresa Guidice says that by eating healthy Italian food she doesn’t have to worry about counting calories or measuring portion sizes, all while enjoying the most luscious foods on the planet. 72% of Americans name Italian food as their favorite cuisine. However, Teresa Guidice explains that there is a big difference between American-Italian and authentic Italian food, which has much less fat and utilizes healthier cooking methods. For example, olive oil is used instead of butter and cream, grilling and sautéing are preferred to deep-frying, and fresh ingredients are emphasized. An authentic Italian diet includes lots of green vegetables ,with carbs like pasta and bread playing a supporting role in the meal, instead of being its primary component. In addition to a wide variety of recipes, information is included in this Italian diet book about the ingredients used in Italian cooking such as herbs and spices, olive oil and pasta. Teresa Guidice gives dieters permission to enjoy their pasta in appropriate portion sizes but differentiates between Italian pasta made from 100 percent durum wheat semolina and inferior products made with processed flour. She also provides a selection of the best Italian recipes for little black dress emergencies, recipes for romance, advice on planning an Italian family dinner and a chapter with fashion tips. Olive oil, tomatoes, zucchini, pasta, fresh fish, shrimp, chicken, pork, veal, steak, pancetta, Italian bread, potatoes, garlic, oregano, basil, parsley, spinach, beans, olives, balsamic vinegar, Parmesan cheese, capers, mushrooms, lemon juice, almonds, strawberries, chocolate, wine. The Italian diet doesn’t include any exercise recommendations. Guidice says she doesn’t follow a strict exercise regime and even though she likes how she feels after she works out she would rather be enjoying her life with her kids than spending time in the gym. Skinny Italian: Eat It and Enjoy It – Live La Bella Vita and Look Great, Too! retails at $19.99. Encourages enjoyment of meals with family and friends, which may improve relationships and reduce stress levels. Gives dieters permission to enjoy some of their favorite foods, in appropriate portion sizes, including pizza and pasta. Emphasizes the use of quality ingredients and fresh produce. Includes information on selecting quality olive oil and pasta. The Italian diet provides nutritional information for all of the recipes. Some dieters will not easily lose weight simply by eating the foods recommended, unless portion sizes are monitored. Many of the recipes contain bread, pasta and flour so will not be suitable for those intolerant to wheat or gluten. Does not include suggestions for breakfast. Will require a fair amount of time in the kitchen. Skinny Italian includes an authentic Italian diet emphasizing the use of fresh ingredients and healthy preparation methods. This book will appeal to dieters who enjoy eating and cooking Italian food without the need to be concerned about how it is going to affect their waistline.